Fishing or photography? Or both? Just over three months ago I had a long chat with Garrett in the Captain Kidd pub that stands by the Thames in Wapping. The conversation resulted with my experience as a picture editor and photographer being recruited to oversee the next stage in the development of Fallon’s Angler. My goal was to add sensitivity and thought to the images that sat alongside some equally well-considered written pieces. I wanted to use as many photographs from the writers so that the images stayed true to each article, encourage the writers to shoot more images if need be, and assist them if they couldn’t work out which end of the camera from the other! Thankfully I found that most writers are quite considered individuals and with this came some well thought out photography. There were also other set pages to consider, including the front and back covers, the “What’s in your bag” spread, plus a new feature ‘Through the lens’ which we have introduced into issue three, which adopts a photo-essay approach to storytelling. 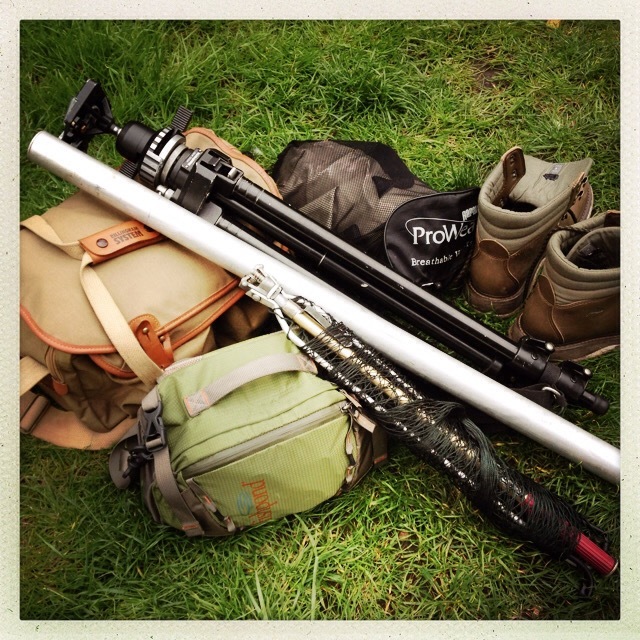 When I load up the car to go on a trip, my kit has a dual purpose; two bags are packed, one full of camera gear, the other fishing tackle; a tripod sits next to an aluminium rod tube, and finally my chest waders. But my priorities have changed. I’m off in search of the right image, the fish are secondary and the waders are not worn to reach difficult places to cast but to capture a more intimate relationship between water, angler and the landscape. Being a professional photographer is a passion similar to angling—a search for perfection—perhaps this is why so many professional photographers are also anglers? In the case of the issue three front cover, I knew I had the images within twenty minutes of shooting with Steve Roberts. I saw the anticipation as Steve approached the river so I simply lay down on the wet grass and snapped away. Fallon’s Angler will now follow Steve with a regular column throughout the year as a river guide on the Thames, Kennet, Wye and possibly further afield. While shooting for Fallon’s Angler over the last few months I have had some wonderful opportunities to fish—invites to “have a waggle”—but I only got to cast a line once. The rest of the time I have been talking and shooting. This has not been an issue though, as my assignments have taken me to some special people, as well as to places like Sweets of Usk, where I discovered the back room of this 100 year old tackle shop, not normally seen by the public, but a sanctuary for Jean Williams and her fly tying. Issue three will be out next week. Perhaps I’m bias but it looks great, feels original and the words get better and better. Next week I’m off fishing but this time I will take just the one bag, well possibly… I may even take the editor?